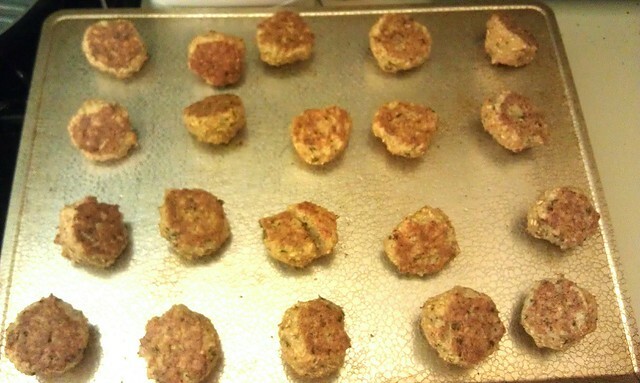 the SLOH road to wellness: Becoming a gluten-free "Italian"
Today I attempted to make my first homemade meatballs. Ever. I *love* meatballs, but before this whole health ordeal, I always just bought pre-made meatballs (especially turkey meatballs - yum!) at my preferred grocery store of the moment. But now that I (obsessively) read ingredients lists, I've realized that there are absolutely NO store-bought meatballs that qualify under my new diet restrictions. Almost all of them have some sort of sweetener or corn product, and it's inSANEly difficult to find gluten-free meatballs, even at stores like Wegmans and Whole Foods (both of which I frequent these days for their typically great selection). So I pretty much haven't eaten a meatball since October of last year. But since this pregnancy has made me super-meat-averse, I've been looking for ways to get a little closer to my required animal protein intake whilst fooling my incredibly picky palate. I tend to find ground or "shaped" meats much less offensive than their whole food counterparts, so I've been living on Wegmans Gluten-Free Chicken Nuggets, eggs and dairy. I'll occasionally attempt other meats, including poultry and fish, but it's a rare day. Now, as you may have noticed, those chicken nuggets do contain corn products and other questionable ingredients like "Tapioca Dextrin"... what?? Luckily, my doctor gave me the go-ahead to relax my dietary restrictions a bit while Squirt is gestating, as it's more important to eat *something* (especially something you can keep down!) than to be super rigid about the diet. Although Matt (the husband) is not thrilled with some of those sacrifices, since I'm essentially passing on said Tapioca Dextrin to his progeny. So I set out this week to make myself some palate-acceptable meatballs with the most whole ingredients I could muster, and I must say, it was surprisingly successful. My inspiration came from The Family Chef, but I made some changes to suit my preferences, as any good Italian cook would (note: I am NOT Italian, but Matt is half-Sicilian, so I consider myself Italian in the kitchen by marriage). Not to say I wouldn't change a few things about my adjusted recipe, but given that I have never made a meatball in my life, I'm pretty proud of my efforts! 1. Grind oats in food processor or blender and set aside. Grind cheese in a similar fashion if you were too lazy to buy grated parmesan cheese and just used the shredded cheese you had, like me, and set aside. Grind all fresh herbs and garlic together until well chopped. 3. Roll meatballs that are about 1 ½ inches in diameter, about the size of a golf ball. 4. Place on a greased sheet tray and if you have time, place in the fridge for 30-60 mins. This will help the meatballs set. 5. Pre-heat the oven to 375 degrees F. Bake for 20 minutes and then turn meatballs over. Bake an additional 10 minutes or until golden brown and no longer pink inside and/or 165 degrees F.
6. After meatballs are cooked, simmer in tomato sauce. *note: I used 99% lean free-range ground white meat turkey breast from Whole Foods. I would probably use the fattier dark meat in the future, as this attempt was just a smidge on the dry side, but still acceptable. **note: For the inexperienced "Italian-style" chefs out there, it's difficult to mess up spices when you're cooking. It's not like baking. Just toss a little in, and see what happens. I was worried that I had *way* too much basil, but it turned out perfect. You could use any herbs you like, and if you prefer to skip the fresh herbs, just toss in a couple shakes of some dried ones - the Italian seasoning mixes simplify this even further, putting them all in one jar! No thinking required! ***personal experience: My molding mixture turned out a little more than "tacky" - I was covered in goo! But given that the cooked meatballs still ended up a little dry (which as I mentioned I'm blaming on the fat content in the ground meat), I'd stick with those proportions of milk & oats next time. I greased my tray with coconut oil which turned out pretty well. I skipped the fridge step because my goal in the second trimester has been to exercise at least 20 mins a day, 7 days a week, so I figured I'd do my 20 min cardio dance video while the meatballs cooked. Matt ended up having to turn them because I wasn't quite finished by the 20 min mark, but I loved the "multi-tasking" and feeling of accomplishing so much! I knew I'd want to eat after the workout, so working out during the fridge step and *then* cooking seemed just too long to wait! I skipped the simmering step 6 too, but it may have helped the dryness of the final product if I had done. I'll probably try that next time, along with using the dark meat turkey. 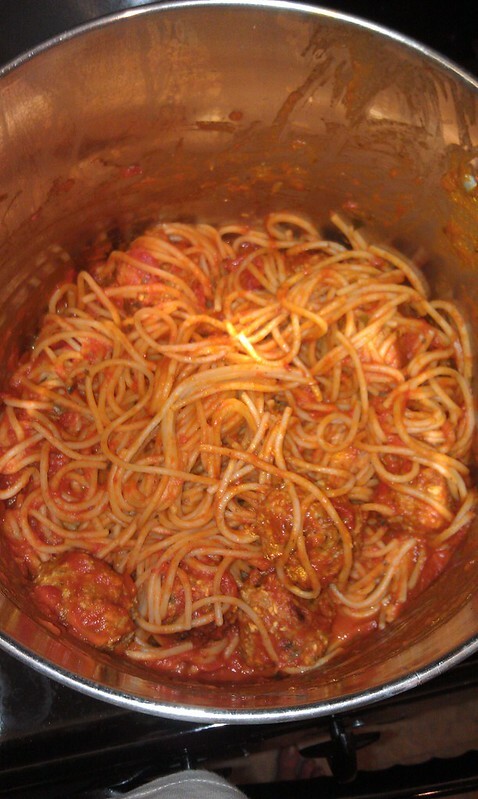 Also, the linked tomato sauce recipe may be my jumping off point for the aforementioned sauce experiment to come. Time will tell. And there you have it - my first (posted) recipe from my new life, and the start to a beautiful love affair with my gluten-free kitchen :) Hope you've enjoyed starting this journey with me, and that it might bring you some healthy ideas as we travel along!